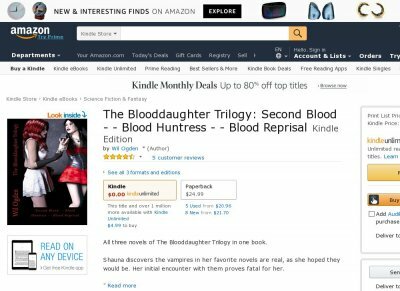 All three novels of The Blooddaughter Trilogy in one book. Shauna discovers the vampires in her favorite novels are real, as she hoped they would be. Her initial encounter with them proves fatal for her. She awakens as one of them, but the mysterious vampire who turned her has disappeared. She is taken under the wings of both the Countess of Philadelphia and the legendary Elizabeth Bathory and soon discovers that even immortality can be fatal. Adjusting to life without the Sun and the need to feed, Shauna travels to Europe to track down the notorious vampire hunter, Henry the Inquisitor. Her companion has particular difficulty adjusting to the new powers in Europe. Defending her friend will make enemies among the vampire royalty.